They say “when in Rome, do as Romans do”. When I travel I firmly believe that motto applies to food as much as anything else. While I’ve heard the odd backpacker in India blaspheme ”I don’t like spicy food” or the visitor to Argentina sacreligiously utter “I’m a vegetarian”, I think it’s best to force aside your food phobias when you travel, or risk missing out on an important part of an overseas trip. If travel is about discovery, then experiencing the local cuisine is certainly one of the ways of immersing yourself in a new culture. From the experience of buying fresh produce at a market to attending a cooking class, to foraging for sweet street treats, even the process of securing a meal in a foreign land forces you to communicate, calculate and sometimes take a leap of faith. Here in Cambodia, there’s a huge array of snacks, drinks, meals and desserts – and they’re not always what you might expect in a South East Asian nation. 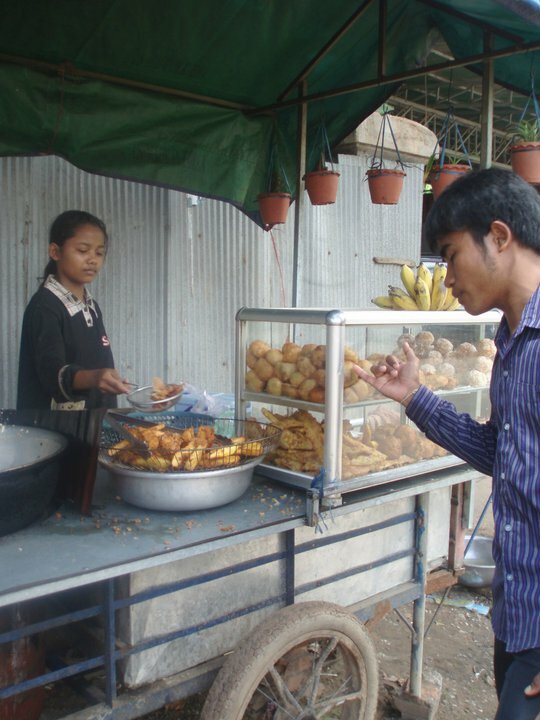 Cambodian street food, just because it looks different, doesn’t mean it’s not delicious. Everyone eats out in Phnom Penh. Rich and poor flood the do-it-yourself soup kitchens every evening and with a delicious dinner and drinks costing a just a few dollars, it is easy to see why. Famed for its exotic fruit, subtle spiced stir frys, fresh seafood, fruit shakes and rice with everything, it also boasts some interesting gastronomical legacies. The influence of former colonial rulers and would-be ‘liberators’ is quite evident, though sometimes bastardised. The French baguette is the national bread and all manner of sweet and savoury pastries also have a proud place in the average Khmer diet. Frogs legs and snails even rate an occasional menu mention. Neighbouring nations national dishes of Pad Thai and Tom Yum soup are restaurant regulars. America’s influence can be seen in the Oreo’s and Coca Cola filling the shelves of the burgeoning Western-style supermarkets, but also in the hot dogs with mayonnaise and lettuce sometimes served for breakfast. The food is certainly fascinating, but it can also be frightening. While the staple dishes of the coconut fish curry amok and the subtle satay-like lok lak are familiar to most tourists, there’s another type of national snack. 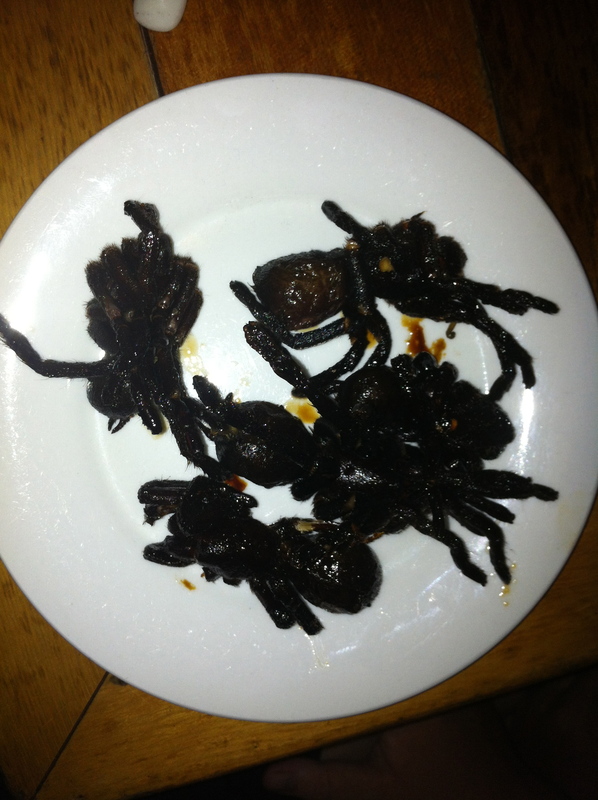 Like other parts of Asia, Cambodia offers a selection of, well, pests. For a person like me who doesn’t like to eat meat directly off bones (yes, I know I’m a big wuss!) having Cambodia’s menu regularly stare at me has been confronting. So it was with a sense of trepidation, only eclipsed by starvation, that I embarked on my wildest adventure into Cambodian cookery. Arriving at the ‘99’ suki soup house and BBQ restaurant the local delicacies were already crammed onto a long table seating me and my thirty closest new ex-pat buddies. Plates of treacly tarantulas glared up at me through glassy black eyes, slithering snakes were sun baked and skewered, bugs in a multitude of shades were piled high but looked like they may awaken and plague our table at any point. First to be seized by my chopsticks was one of the crunchy crickets. As though stunned still, they lay jumbled and entwined on the plate with subtly striped bodies and spikey legs. 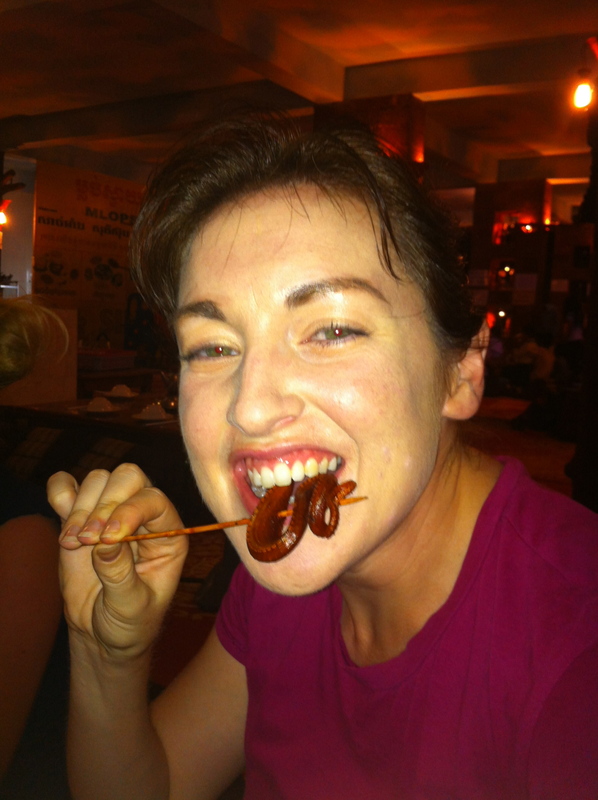 As I told myself it was not strange that people here eat insects, just strange that Australian’s don’t, the chopsticks went into my mouth and I forced myself to bite down and endure whatever might come … and there was a surprise – it actually wasn’t bad. Certainly crunchy, but also salty with a touch of sweetness. Before I knew it, I’d reached for another. 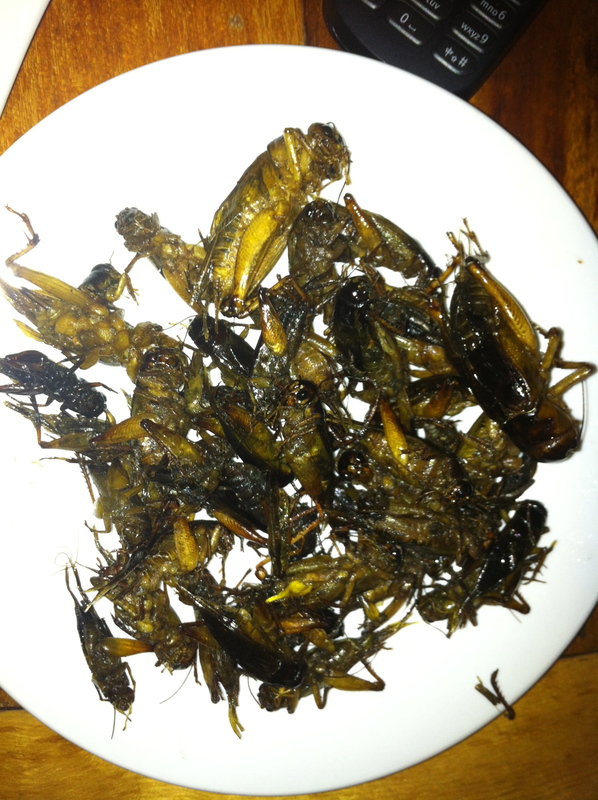 As they crackled in my mouth, I could understand why Cambodians will happily munch on a large bag of crisp crickets just as we might chow down popcorn while watching a movie or having a family barbeque. Does this inspire you for dinner? Jayne says it’s actually not that bad. Yet another five dollar tower of Angkor pilsener arrived, helping the food slide down more easily and building some Dutch courage at the same time. Next were the snakes – a tricky thing to tackle, least of all because I kept thinking of the ones you see as road kill baked onto an outback Australian highway in the summer. Their leathery skin had to be stripped from the bamboo skewer and then peeled from the spine. The taste and texture is quite like beef jerky. A bit salty with a beefy taste and a tough chewy texture. I munched on a few beetles and some fairly unexciting eel marinated in a terracotta hot pot, only delaying the inevitable – the spider. Just like show food, don’t you think? Black as death and nearly as scary, its deep fried limbs curled beneath its large rounded body. Too big to be swallowed in one hit, I was forced to first pick off the hairy legs before tackling the question of whether to eat the head and plump body too. The legs were simple enough. Snapping off easily, they were crispy and quite sweet, evidently having been drenched in some sweet sauce before being sizzled in hot oil. I tried not to think about it, but you could certainly feel the hairs scrape against your throat as you swallowed each limb. I’d come this far – so the tarantula body had to be devoured too. After all, he only looked half as scary without his legs now anyway! And I told myself this was a once in a lifetime experience and I didn’t want to be the girl who told the story where she didn’t eat the whole spider. On the outside crisp and crunchy, I imagined the inside might burst with dark liquid, but it was soft and meaty. It tasted of offal and the texture reminded me of the little chunks of kidney you get in a steak and kidney pie. So that was that. All done. Bon apetit. Did I enjoy it? Yeah, it was OK. Would I eat these things again? Probably only the crickets. But you know what, eating meat off bones isn’t really that scary to me anymore. What’s the strangest thing you’ve ever eaten abroad? Tell us in the comments space below. Next > Help, my lipstick won’t fit in my suitcase!